The public library has been given a bad reputation recently. Not only are the buildings stereotyped as being dull and drab, staffed by dour librarians and offering only outdated, unwanted books, but when parents don't use the local library then children never learn to see past these stereotypes either. In reality libraries are vibrant places filled with multimedia resources and staffed by dynamic information professionals, but if children have never set foot inside their local library then they'll never know this. Isn't it about time that you introduce your child to their local library, and begin to access their many free resources as well? All local libraries offer reference services, though they may not be advertised as such. Reference services simply mean that a member of the library staff can advise you on your research. This can range from pointing you towards correct resources on a general topic to helping you answer a specific question. However, reference services do not exist to answer your child's homework questions. For example, a librarian could help a child find an atlas and explain how to use the book to find information on a particular country, but it is unlikely that a librarian will do this research him or herself and simply give the child a specific answer. Nor should you want them to - part of the value of the local library is that it allows you and your child to learn more about finding and organising information. These skills are important for daily life, education and later careers. Public libraries generally offer a range of research materials for public use. Not only can library members check out books from the library, but most can log on the Internet, use the library's subscription to databases and read the magazines and newspapers available. Many libraries also offer DVDs and CDs for short loan so music and films can be accessed as well. Local history, heritage and genealogical resources are also commonly found in public libraries though these collections may be available only by appointment. To find out more about what is available at your local library just ask a librarian or take home some of the pamphlets on display. In addition to non fiction resources, local libraries offer a wide range of leisure reading as well. From glossy magazines to bestsellers, graphic novels to newspapers, the local library provides a vast number of resources for little or no charge. Most children's leisure reading is well marked and displayed, and often special young adult collections are put together as well. 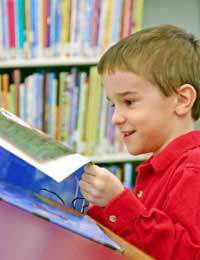 Whether a child needs to find a book for a school book report or you want your children to read more over the holidays, your local library should be one of your first stops for these materials. Finally, in addition to all kinds of research and leisure reading materials, local libraries tend to offer programmes of events as well. Many libraries offer classes for children, teens and pensioners, as well as story hours for kids and craft times for children and their parents. Film showings, writing groups, play groups, conferences, workshops and seminars all may be offered at the local library as well. If you'd like to get you and your child more involved, log on to your local council or library website or pop in to your local library for more information. No doubt you'll be glad you did!